[Poster for Harper’s New Monthly Magazine, Jan 1897]. Man reading his Harper’s by green lamp. Five-color lithograph and letterpress: yellow, vermilion, green and black. New York: Harper & Brothers, published Dec 1896. Signed top right: EDWARD | PENFIELD | bull’s head logo. 13 9/16" w. x 18 5/16" h.
Ref: Flood, 266; DFP, 375; Keay, 87; Lauder, 192. 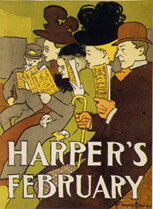 [Poster for Harper’s New Monthly Magazine, Feb 1897]. Five people in trolley, all reading Harper’s. Five-color lithograph: grey, yellow, orange, brown and black. New York: Harper & Brothers, published Jan 1897. Signed bottom right: EDWARD PENFIELD. 14 5/8" w. x 19 1/4" h.
Ref: Flood, 267; Studio, pg 144; Margolin, pg 57; DFP, 375; Gibson, 8; Lauder, 193; Brandt, 69. 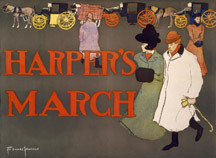 [Poster for Harper’s New Monthly Magazine, Mar 1897]. Couple walking past line of hansom cabs in background. Four-color lithograph: yellow, vermilion, grey and blue. 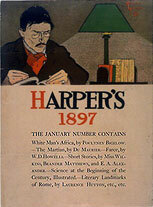 New York: Harper & Brothers, published Feb 1897. Signed bottom left: EDWARD PENFIELD. 19" w. x 14" h.
Ref: Flood, 268; Studio, pg 145; DFP, 376; Wong, 68; Gibson, 4; Lauder, 194. 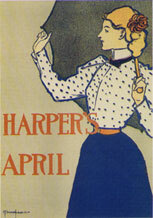 [Poster for Harper’s New Monthly Magazine, Apr 1897]. Woman in polka-dotted blouse and blue skirt, holding parasol. Four-color lithograph: grey, yellow red and blue. New York: Harper & Brothers, published Mar 1897. Signed bottom left: EDWARD PENFIELD. 13" w. x 18 1/4" h.
Ref: Flood, 269; DFP, 377; Lauder, 195. 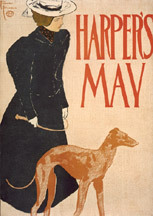 [Poster for Harper’s New Monthly Magazine, May 1897]. Woman walking her greyhound. Four-color lithograph: brown, yellow, red and black. New York: Harper & Brothers, published Apr 1897. Signed top left: EDWARD | PENFIELD | bull’s head logo. 13 1/4" w. x 18 7/16" h.
Ref: Flood, 270; Studio, pg 144; DFP, 379; Lauder, 197; Brandt, 70; PCI-5, 2; Swann-1941, 357. 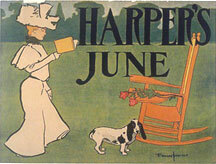 [Poster for Harper’s New Monthly Magazine, Jun 1897]. Woman reading, walking by rocking chair, flowers and basset hound. Four-color lithograph: yellow, red, blue and black. New York: Harper & Brothers, published May 1897. Signed bottom right: EDWARD PENFIELD. 19 3/8" w. x 14 1/4" h.
Ref: DFP, 379; Wong, 69; Lauder, 197; Brandt, 71. 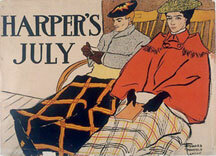 [Poster for Harper’s New Monthly Magazine, Jul 1897]. Man and woman seated on ship’s deck, bundled up. Three-color lithograph: yellow, red and black. New York: Harper & Brothers, published Jun 1897. Signed bottom right: EDWARD | PENFIELD | LONDON. 19 1/8" w. x 14 1/8" h.
Penfield married Jennie Judd Walker, daughter of Mjr Charles Walker, on 27 Apr 1897. In the summer, the newlyweds travelled to England and Europe for their honeymoon, accompanied by Mjr Walker. This poster is signed "London," and presumably shows Mrs Penfield with her father on-board the steamship. Ref: DFP, 380; Wong, 70; Margolin, pg 69; Gibson, 5; Lauder, 198. 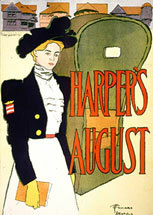 [Poster for Harper’s New Monthly Magazine, Aug 1897]. Woman with Harper’s walking by covered beach chair, houses on boardwalk in background. Four-color lithograph: yellow, red, blue and green. New York: Harper & Brothers, published Jul 1897. Signed bottom right: EDWARD | PENFIELD. 13 1/4" w. x 18 1/2" h.
Ref: DFP, 381; Wong, 71; Margolin, pg 58; Lauder, 199. 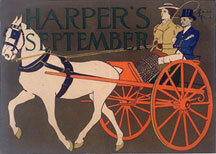 [Poster for Harper’s New Monthly Magazine, Sep 1897]. Mismatched couple in horse-drawn exercising cart. Five-color lithograph: yellow, brown, vermilion, green and blue. New York: Harper & Brothers, published Aug 1897. Signed top right: EDWARD | PENFIELD. 18 3/8" w. x 13 1/4" h.
The take-charge’ attitude of this independent woman certainly seems to put-off the diminutive driver. Ref: DFP, 382; Wong, 72; Lauder, 200. 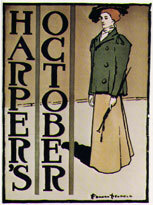 [Poster for Harper’s New Monthly Magazine, Oct 1897]. Vertical type arrangement, woman in green jacket for fall, holding closed parasol. Four-color lithograph: red, green, brown and black. New York: Harper & Brothers, published Sep 1897. Signed bottom right: EDWARD PENFIELD. 14 1/4" w. x 19 3/8" h.
Ref: DFP, 383; Margolin, 59; PAI-20, 375; Lauder, 201; PAI-31, 616. 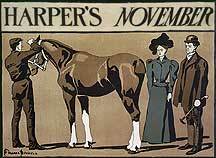 [Poster for Harper’s New Monthly Magazine, Nov 1897]. Couple looking on as groom brushes down a show horse. Four-color lithograph: pale brown, dark brown, green and black. New York: Harper & Brothers, published Oct 1897. Signed bottom left: EDWARD PENFIELD. 19 3/8" w. x 14 1/4" h.
Ref: DFP, 384; Lauder, 202. 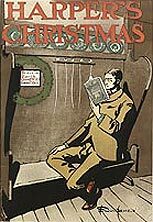 [Poster for Harper’s New Monthly Magazine, Dec 1897]. Young man on bench reading Harper’s. Five-color lithograph: yellow, brown, grey, vermilion and black. New York: Harper & Brothers, published Nov 1897. Signed lower right: EDWARD PENFIELD. 13 3/16" w. x 18 13/16" h.
Ref: DFP, 385; Lauder, 203.